After Vogalonga, my family and I boarded a cruise ship and sailed for the Greek Islands. My daughter Cassandra and I stationed ourselves that evening with our cameras on the top deck and blew through about four hundred images. It was a great opportunity to see Venice from a higher vantage point, and with my long lense, I got this shot of the canal that leads from Canale di San Marco, through Castello, and into the Arsenale. Murano can be seen further back and then the north end of the lagoon. 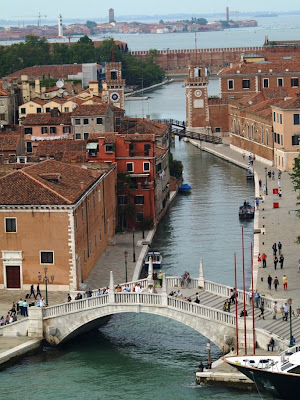 Just out of the shot, to the right along the fondamenta is the Museo Navale - well worth a visit. You'll see more photos from that session in the future.